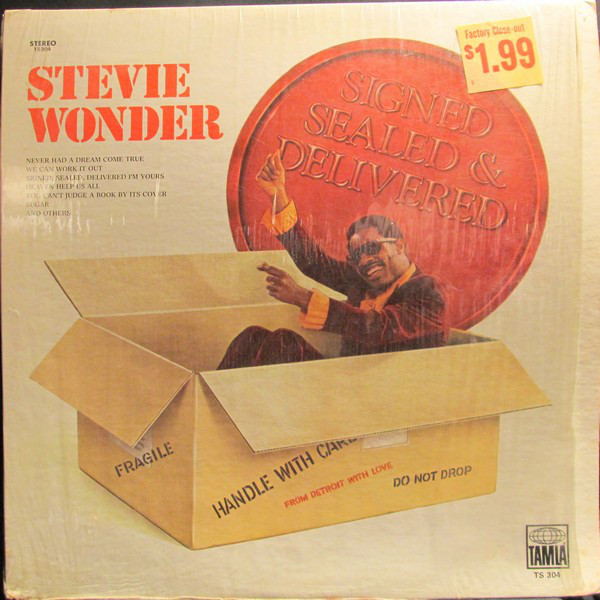 This was Stevie Wonder's first album of the seventies, and, like fellow Motown artists Marvin Gaye and The Temptations, he was starting to rebel, (if that is the right word to use - probably not), against the Motown "hit factory" conveyor belt of poppy, chart-aimed material. He wanted to express more social concerns in his music, and introduce more experimental sounds - electronic keyboards, funkier rhythms. This was very much an album that showed the first telling signs of that change, however it still has some strong echoes of the previous decade hanging around, particularly at the beginning. For me, it is the last of the sixties albums, as opposed to the first one of a new era. There is definitely change in the air, nevertheless, so maybe on reflection it is the start of "seventies Stevie". "My Cherie Amour" was the one that saw the sixties out. 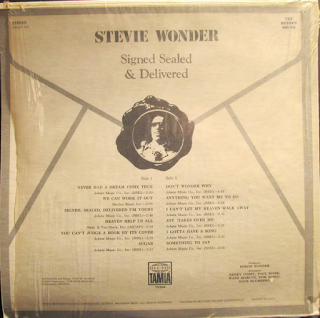 Certainly, the album's two biggest hit singles - the poppy, singalong "Never Had A Dream Come True" and the eminently sixties-ish classic Motown of "Signed, Sealed, Delivered (I'm Yours)" did little, initially, to suggest that a sea change was in progress. The likeable, quirky, upbeat cover of The Beatles' "We Can Work It Out" showed a willingness to experiment with changing the sound and feeling of a well-known song. It has a decidedly funky, clavinet introduction. It really rocks and thumps, actually. Great stuff. "Heaven Help Us All" showed that social conscience coming through for probably the most palpable way on any of his songs thus far. It is a soulful, at times gospelly warning of the perils of guns, street crime, poverty and war. It is melodic and uplifting, musically which adds extra poignancy due to its sombre subject matter. It was the most hard-hitting, portentous number he had recorded. It also became a hit single. From its first notes, you feel this is a song worth listening to. "Heaven help the black man if he struggles one more day....". Stevie had never been so "conscious". "You Can't Judge A Book By Its Cover" is a grinding, powerful piece of funk. This is as funky as Stevie has sounded. Proper adult music a long way from the tuneful pop of a few years earlier. "Sugar", while a love song, had a funky bass line and rhythm to it. "Don't Wonder Why" is a big-production typical Wonder ballad, full of lush orchestration and trademark vocals. At nearly five minutes, this is no throwaway three minute poppy number. "Anything You Want Me To Do", however, sounds more like early/mid sixties to early seventies. Very much a blast from the past, sound-wise. "I Can't Let My Heaven Walk Away" features some of that trademark harmonica in a very typical piece of early seventies Motown. "Joy (Takes Over Me)" is another bluesy, harmonica-enhanced workout. "I Gotta Have A Song" is probably the one that points most strongly to the tone of much of his seventies material in its easy-going, laid-back verses. The same vibe is continued even more in the effortless groove of "Something To Say". 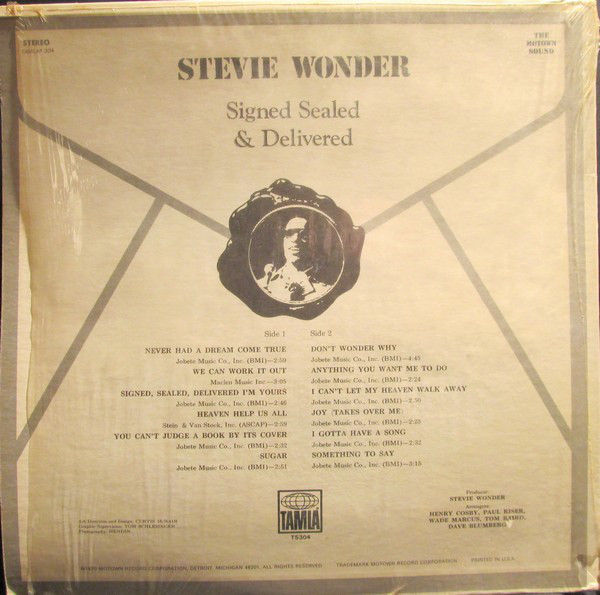 The sound, by the way, as on all the Stevie Wonder albums, is a lovely, full, punchy Motown stereo. It is a most enjoyable listen. Whereas "My Cherie Amour" had seemed to be a bit of a "treading water" album, this one was far more "on it", so to speak.